It's been a while since I've posted... a long while actually. Some of you have written me... expressing your concern about my absence and I have been blessed by your love. But I am also ashamed of myself because you are my friends and family... and I sorta just quit talking to you. Please forgive me. You see, after Michael's surgery, with him being home all day, every day, it became difficult to find the time to write. And then when I did have a little time, I wasn't sure where to even begin. And the longer time went on, the less unsure I became until I wondered if I should be blogging at all. But I've missed you. I miss sharing my heart and life with you. I miss sharing God with you. And I miss you sharing your lives with me for you always bring such a smile to my heart with all your love and blessings! And the truth is that life has been full of stories worthy of sharing. Michael is fully healed and back to work... yay! I continue to create new art. And my life has made a huge turn with my recent decision to start selling at Portland Saturday Market. Saturday Market is a huge outdoor market and a renowned tourist must-see. I just finished my fourth weekend there. Funny thing is, I did the Market about 18 years ago, shortly before I started writing and illustrating my books and here I am... back again. Does God have a sense of humor or what?!?! You see, the reality is that the economy and changing times has not been so nice to Michael and I, as I know it has not been to many of you who read my blog. And with Michael's surgery, medical bills and time off work, we just kept praying and believing God to show us a way where there seemed to be no way... and He is faithful as always. Everything kept pointing to the Market and I am now not only blessed by the extra income, but by the opportunity to be a light in the world and a seed sower of His Word through my art in this venue! To be honest, it has not been easy... physically, emotionally and even spiritually... but I know that I am where God wants me to be... and that He is with me. I am meeting some absolutely wonderful fellow believers from all over the world every weekend and I look forward to seeing what God has in store for the days ahead! And I look forward to taking you on this journey with me! beginnings... to those of us who put our faith in Him. doors for my artwork to find new product homes. and I'm loving the detail that's happening in the background! class and water aerobics... both new to me and so much fun! My granddaughter, Alexis, even decided to join me for Zumba! and a flag banner I'm making from vintage Bingo cards. 5. We've been going to a new church for the past few weeks and loving it. 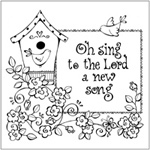 encourage your heart to trust in the new mercies God gives us each new day! will find your courage in Christ and take the step! willing to learn, grow, and experience new things... for your glory! Yesterday, I officially entered a new era... and celebrated my 60th birthday! It's funny... it just seems so fitting... like I've been waiting to get here. That does sound kinda strange, doesn't it? I don't understand it... but it's true... I am 60... and I'm so okay with it!! I told a friend... it's like my age has finally caught up with my hair! LOL! hosted a gathering of a few of my dearest friends to help me celebrate! draw out this special birthday celebration as long as possible!! I love games so I was tickled to play a new one called telephone pictionary? come to think of it... only this form is not harmful. so kindly left their Birthday Blessings... you made my heart smile big!! "LORD, remind me how brief my time on earth will be. Remind me that my days are numbered--how fleeting my life is. through them. Father... bless them in return today...with Your love! nineteen books and licensed my art to many different manufacturers. in the beginning my medium was color crayons. inside the lines. I took great pride in those early works of coloring book art. tradition from one generation to the next. give a talk on encouraging artistic creativity in children. in shaping the future of my daughter forever. Too Old? I don't think so! my husband just kinda rolled his eyes. for all of about 10 seconds... and decided to just go for it... it's only toes. noticed them and exclaimed... "I thought I was TOO OLD to wear that color!" My older sister just rolled her eyes... similar to the Michael roll. So the natural response would be if Jackie's too old then surely I must be too. who decides at what age... which colors are appropriate and which are not? because heaven forbid we would wear serious ORANGE! So what do you think... am I too old to wear green nail polish? Are you? I don't think so! But seriously... what do you think? "grab your camera and come out here!!" with water flowing from the kitchen sink. We danced a little... and filled the heavens with our praises and thanksgiving! Why such a big deal? You see... we've been without water in the kitchen for almost 6 months. We've pretty much been without a kitchen for almost 6 months!! Running water was the finishing touch to having a fully functioning kitchen! I smile just thinking about it! and some trimwork on the cabinets! I am so excited to share it with you... it's been a long time coming!! Some say that an artist needs to hone in on one style. I can understand that. But I'm not there yet. I was for a while. But now I'm not. For now I'm still playing. Trying new things. Experimenting. Seeking and seeing God in fresh new ways. The truth is I love many different art styles. So do I really have to choose one over another? Because I am not just one. I am a little bit country. I am a little bit rock and roll. I am a little bit botanical. And a little bit abstract. I am conservative. Radical. Quiet. Loud. Serious. Silly. I'm a little girl. And an old woman. I am complex. So are you. Don't let anyone tell you, you have to be one thing or another. The complex and creative woman God designed you to be. It takes faith... not in yourself... but in Jesus. because I know you are a lot like me! Created in the image of God... and for His glory! Don't forget it. Celebrate it. Live like it! and writing down goals for the new year ahead. But this year is different... at least for now. tending to the priorities... and today's priorities seems to be white! I closed 2010 with a paintbrush loaded with white... lots and lots of white. with at least one more left to go! This is what it looked like before... I like the white better, don't you? and family room... isn't it looking gorgeous? Tomorrow... and until it's finished... I'll be painting it all white. But I LOVE white... so I'm glad to paint it. Clean. Light. Bright. Pure WHITE. What a great way to start the New Year too... thinking about the color white. It makes me want to think of the holiness and purity of God. It makes me delight in the fact, that in His eyes, we are white as snow. like a clean white canvas ready to be painted on. as I allow God to have His way in me and through me. How about you? Are you looking forward to a colorful year ahead? I thought for sure I would have a kitchen by Christmas. Not quite. Now I'm hopeful for Valentine's Day... maybe even earlier. and I keep hearing God say "count it all joy..."
So in the beginning... this was our kitchen when we moved in... Sept. 23rd. It is quite small but cozy... with a nice size family room addition. This will be a great family/tv room... someday soon! and what was the dining room through the doorway... more on this later. Michael spent quite a while on the laundry room but I'll show you that later. and the cabinets were the first thing to go. now... not so cool but still so thankful for it. and time out for replacing a large section of the roof. so the sheetrock had to come down... but thankful for the discovery! while an electrician friend was replacing all the wiring! for where a counter/eating bar will be... and electrical was wired!! sadly however... Michael's shoulder is still suffering from that demolition. Jeff and his boys showed up with sheetrock! this was a beautiful site to see!!! really quite colorful and pretty... but do have cold air coming through! Could hardly quit smiling as we began trimming out the windows and doors. That's where we're at today. an incredible picture of what it means to be rescued. an opportunity to blossom into something of beauty and great value. I know in my heart God has a plan for this house to be used for His glory! He rescues us... gives us new life... and uses us for His glory. to count your blessings and truly give thanks. so many of the things we so easily take for granted... it's inspiring! you thanked God for indoor plumbing and a flushing toilet? Well, it's been at the top of my list recently! top of the drainfield for the septic and thus the septic had failed! Duh! No Septic = No Flush! Jack in the Box up the road and then went back to Battle Ground to sleep. Our hearts were overjoyed the day the truck arrived with a new septic tank! And gently lower it into place! to this... and it will stay this way until next spring. were able to hide all the mess behind the fence... thank You Lord! and all the men who played a part in getting it installed! I'm giving thanks for the flush! How about you? "Every good and perfect gift is from above..."
and Michael and I are having a gloriously great time here with the girls! and being there for Jessica's first soccer game of the season. so hard I cried!! I haven't done that in so long... and it felt so good. go and let God have His way in every area of my life. I know His plans for me, for us, and for you... are all good. expectation of what is yet to come. My heart is encouraged by God's grace and sovereignty... hope yours is too. 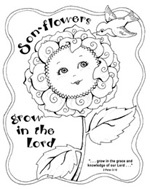 for art and resources to grow in the Lord and be a blessing to others along the way!